I little realised how far the art of office warfare has progressed. Today’s invention is an addition to the cube war arms race. It consists of a bow which can be filled with soft projectiles with which to attack one’s unsuspecting co-workers. 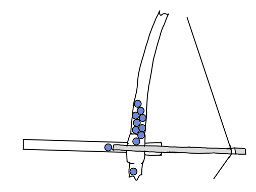 A captive arrow is retracted, bending the bow and allowing a pellet (nerf, or even marshmallow) to descend into the barrel and be blasted at your enemy who got that desktop trebuchet for christmas. This could also form the basis of an umbrella that spies could use to shoot each other with poisoned pellets on Westminster bridge.